Toast is advertised to handle many kinds of videos and AVCHD camcorder videos for converting to standard-definition (SD) and burn to DVD, convert and transcode to formats like MP4, MOV and even burn Blu-ray disc. However, after converting my Panasonic TM700 camcorder AVCHD videos to MP4, the resulting movies have an out-of-sync audio track. 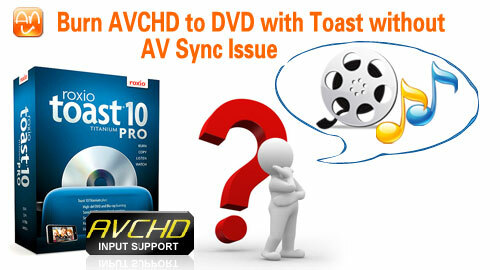 There is also audio/video sync issue when I try to burn AVCHD to DVD with Toast. Thinking the main reason might be the unstable support to AVCHD format in Toast, I looked for the Toast alternative for Panasonic TM700 to convert HD video to MOV or MP4 on Mac without the AV sync issue. And then I could burn video to DVD with Toast. After a quick search, I find Aunsoft Video Converter for Mac as the recommended Toast alternative for Panasonic TM700 to converter AVCHD to MOV on Mac. I tried it and it works like a charm without sync issue. Here is the workaround to convert AVCHD videos to MOV and then import the MOV videos to Toast for burning to DVD with no audio and video synchronization problem. The first step is to load videos for conversion. Run Aunsoft Video Converter for Mac as the best Mac Panasonic video converter, and then click the "Add" button to load Panasonic TM700 .mts videos. Otherwise, you can drag and drop the .mts file from computer folder to the application UI. The second step is to choose output format for Toast. Click the "Format" option, and navigate the mouse cursor to the Adobe Premiere/Sony Vegas group, and select the option MOV (AVC)(*.mov) as output format. The Toast alternative for Panasonic TM700 will transcode AVCHD video to MOV for Toast or even QuickTime player. The third step is to start conversion. Click the convert button below the preview window, and the conversion from AVCHD to MOV for burning to DVD will start immediately. After the conversion, input videos to Toast and burn to DVD. Well, it is easy to get AVCHD to DVD for DVD player. 1. As the original AVCHD video from Panasonic TM700 contains Dolby Digital AC3 5.1, the output MOV video also includes 5.1 surround sound. It is a pity that Roxio Toast 10 Titanium does not keep the 5.1 channels when burning to DVD. Nevertheless, you can enjoy the DVD on DVD player without sync problem. 2. If you are using other AVCHD camcorders like Sony HDR-SR1, HDR-SR11, HDR-CX350, HDR-XR520, Canon HF10, Panasonic HMC-150, Lumix DMC-ZS3, HDC-HS300, HDC-HS700/SD700, you may also use the Mac AVCHD video converter. The Toast alternative also converts with TiVo to MOV for playback on Mac, or TiVo to MP4 for iPad, iPhone 4, iPod Touch 4G. You may also go to the Panasonic video solution column for more information. 3. If you would like to backup your Blu-ray disc and DVD movies, just try Aunsoft iMedia Converter for Mac to remove protections or region code.